1. Enhance your makeup. By creating a smooth surface, a primer prevents pigment streaks and splotches. 2. Absorb oil.Some primers are made with polymers designed to soak up excess sebum so you won't get shiny or that "muddy" look when facial oil interacts with makeup. 3. Hide large pores. Primers smooth over pores, creating a silky, even layer. 4. Diminish wrinkles.Primers perform like spackle, filling in minor grooves and lines with a blend of silicones. 5. Correct - don't hide - skintone. Some primers are tinted to offset discoloration. You can apply a translucent layer of correction without hiding natural-looking things like birthmarks or freckles. Smooth a drop of green primer over ruddy skin or try a purple-toned primer to brighten sallow skin. a damp cosmetics sponge or your fingertips. 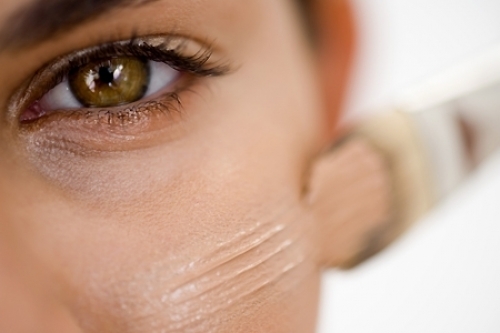 You can wear primers on bare or hydrated skin, either with makeup or alone.